Rain step-danced on the rickety asbestos roof as we savoured the delicious vada pav. It has only been a few minutes since we escaped from the frenzy city that now lies 700 meters below, 12 miles away. We’re in the land that Sahyadri adorns so well during monsoon, it is only when you touch it you believe it’s not an illusion. It is probably her greatest possession for miles north or south. The city-dwellers, like me, have chosen to come cherish this crown forest hidden away, literally, from prying eyes. No one questions anyone’s presence here – nor do they acknowledge it. It is a world in itself, whole – with gaming stations to liquor shops – a place where no vehicles are allowed, except for the neighing horses. If you’ve visited this place, you’d probably know I’m talking about the mighty Matheran – a hill-station we all love in our own ways. Matheran, over the years, has grown into a city in itself. Hotels and so-called cottages sprawl along the very edge of the mountains, and horses, hundreds of horses, ply daily the neatly paved roads, their masters avoiding the mucky paths made particularly for the horses’ feet. A large cell-phone receiver, today, towers over the tallest evergreen trees probably a few years over hundred old. Such is the extent of development, that it is easier to find a soft-drink over a glass of water. Yet amidst this bustling town growing rapidly from all sides, there are natural wonders that give Matheran its name – the crown forest, or literally, forest-over-the-forehead. This crown today is fast balding. The footfall to Matheran has increased tremendously – and it is only fair that people go out of the cities to cherish the bounty of monsoon. What worries me is the question: at what cost? People in Matheran on July 14, 2012 left behind hundreds of glass bottles in the cottages, a hundred more were thrown into the forests and the valleys. Monsoon has been, and has become more largely, a reason to irresponsibly party in nature’s lap, and ignorantly leave behind every piece of trash that will do more harm than good. I do not know the future of Matheran, nor of its famed flora and fauna, but I know this: unless stringent rules are implemented on capping the growing hotel constructions, Matheran is going to be run over by unsustainable, ill managed plans that will be hard to be undone. I do believe it is not merely the impact of the footfall of tourists that will affect the biodiversity of this region – it is the tourism industry that is unwillingly encouraging tourists to be irresponsible, is what is going to strip ecologically significant areas like Matheran of their natural glory. If I shudder to think of the future of our crown forests, I get a fit thinking of what will happen of Mabaleshwar hillstation I visited last month. Since we were at Matheran for two days, we sought shelter in a small cottage overlooking Garbut Point, the room smelling of fungi and dampness. We got out as soon as we could, and explored the less-sought destinations that are suffixed “points”. Our objective was a shared one. Everyone who had come, or has come, came to attain peace of mind. Ours was met with treading less-frequented places (where the biodiversity is conserved simply because the Littering Folk have not discovered some regions), and to hunt plants and animals in deep and dark forests, and to simply wander where we saw no humans, not even us, for we lost our physical being for couple of hours in the shrouded forests. We came to Matheran for peace of mind. Utter peace where silence formed an ideal backdrop to the twittering of Raorchestes bombayensis, the Bombay Bushfrog (also called Typewriter Frog); the rustle of scales of Ahetulla nasuta, the Vine Snake (also called Whip Snake); and the chorous of Duttaphrynus melanostictus, the Common Indian Toad; Ramanella montana, also called Jerdon’s Narrow-mouthed Frog, and numerable insects, birds and talking trees. It will anger the mighty Matheran if I say he did not welcome us kindly. The clouds were unfurled and a glassy blue sky was gleaming down at us, yet the sun was hidden – tucked away in the early eastern sky by a monstrous cloud cover. Rain was suspended as drizzle in thin air, flying up and down from all directions – an umbrella didn’t help keep us dry, but the rain, as snow, did not soak us, but merely settled and cooled our city-sickened body. We were headed to the north, and away, from the Matheran Township, towards Panorama Point. Panorama point stands alone on the northern tip of Matheran, its path leading straight from a variety of habitats – from the dense cover of Memecylon umbellatum, the Ironwood tree, to freshly sprouting Strobilanthes callosus, the Karvy, to rocky cliffs and crevasses, to the wide-angle, 180 degree view from its tip. Panorama Point is a less frequented place of Matheran. It is a naturalist’s paradise. One of my cherished finds here was a little epiphytic orchid dotting a broad tree trunk. It stood only at two inches, and contained a strand of little buds, green and dripping wet. The botanists say it is Eria dalzelli, I simply engorged on its beauty. Tree trunks when wet not only absorb soil, but also nutrients from the air, and these microscopic particles form a little niche, where algae, fungi, lichens, and epiphytic ferns, orchids, and some parasites take root. While the orchids only anchor themselves to the trees, parasitic plants like Tolypanthes lagenifer, a kind of the Mistletoes, seeks nourishment directly from the tree. We also found a strikingly beautiful plant for a parasite, which rests underground for most of its life, but sends out its flower that give out a ghostly glow, the Christisonia calcarata, commonly called Spurred Christisonia. It is a parasite on Strobilanthes callosus, Karvy, which flowers once every seven years. 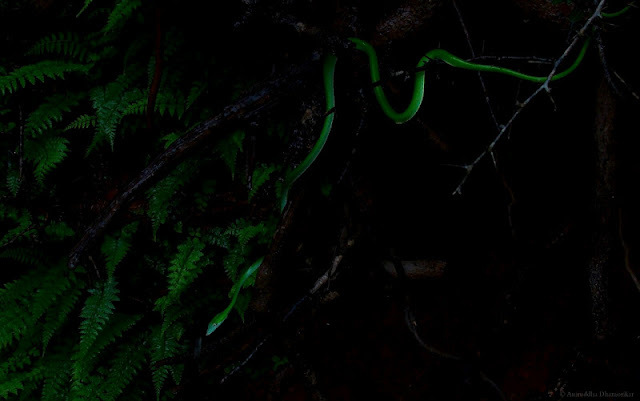 While we sought plants that stood by the path, our attention was caught by the ones that most strikingly mimic the creeping vines – the Vine Snakes. It is with pride when one says he spotted seven Vine Snakes in two days – which we did, with eyes trained to distinguish the green, from the greens. It sat on a rock by the side of the road. Beetles in the family Buprestidae are commonly called Jewel Beetles, although not all Buprestids have jewel-like colours. This fellow is like the many grubs of Buprestidae family which are woodborers – they eat the plants from the inside, pupate, and emerge as wonders of the world. Firefly larva feeding on a terrestrial snail: If poets knew about the pre-metamorphic lives of Fireflies, I wonder how their poems would sound. The larvae of Fireflies are predatory, and specialize on hunting for snails. They can be considered as excellent controllers of snail populations, whose young ones are now feasting on the foliage. Whether they stalk the prey or wait for the snails to creep up to them, I do not know. But observations state that they are usually stationary, after all snails are not as slow as they appear to be, especially if they appear in their thousands during monsoon. It is a common sight if you observe in dense thickets along paths, where they commonly appear sitting over the leaf surface, their heads deep inside the snail’s flesh. Some beetles in the subfamily Hispinae of the Chrysomelidae (Leaf Beetles), are covered in protective spines all over their pronotum and elytra. In evening we paid our tribute to most sought-after regions of Matheran – Charlotte Lake, Echo Point, and Lords Point, and held our breath as we saw the spectacles Matheran had to offer. The illusion of waterfall defying gravity – thanks to the upward drafts – was real. A Waterrise (or water-rise) is a gravity defying phenomenon when water falling off a cliff rises up towards the sky. For a person standing up-side-down, a waterrise may appear as a waterfall. 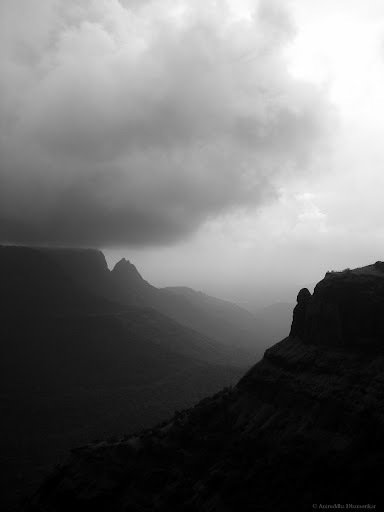 The sheer cliffs of Sahyadri, also called the Deccan Traps as you go further east, form a blockage to the westerly winds blowing from the seas – sending them speeding upwards in speed reaching up to 38 knots. 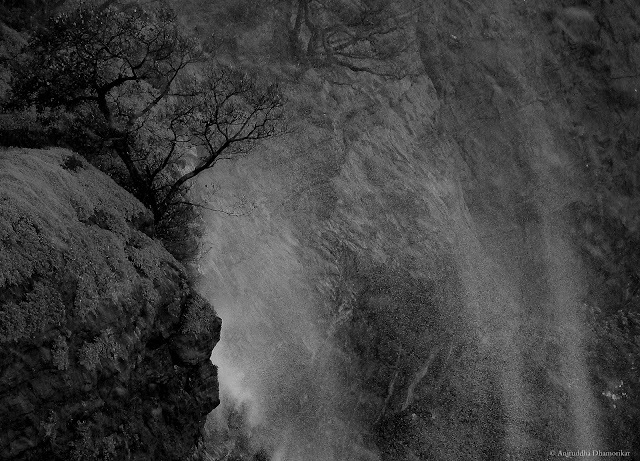 The wind provides enough leverage for waterfalls to actually rise up and fall back upon the land. It was a spectacle I froze in my memory. Going back to the moldy room, I’d need it to lull me to sleep. In the night, as owls we emerged from the little room on the empty streets, to witness and hear another spectacle very few have heard of: the choir of amphibians. Our start of the midnight orchestra begun with what sounded like someone sending a Morse code. But this sound was more than a mere code – it was a call of love. Elsewhere, other males made sure they were heard too. This little frog is as big as it gets – a little less than one inch. Including the vocal pouch, it goes well beyond two inches. Matheran is filled with the twittering of these frogs, and, besides the school-boy whistle of the Malabar Whistling Thrust, the Bombay Bushfrog is probably the most widespread sound of Matheran – it almost forms the identity of this crown forest. Frog calls of different wavelengths lured us from the dark way towards Paymaster Park. No creature seemed to be stirred, but their call was so loud, our voices were hushed, and we slowly walked to the source of the frog’s musical notes. Finding a frog from its call is a delighting experience. It is a game requiring close attention without sudden movements. It makes your hearing sharp and seeing strong. After watching the many love struck Bushfrogs and Toads, we traced back to our little room. On the porch light I counted 12 species of moths that were new to me, of which I photographed 9. I crashed having partially achieved a peaceful mind. 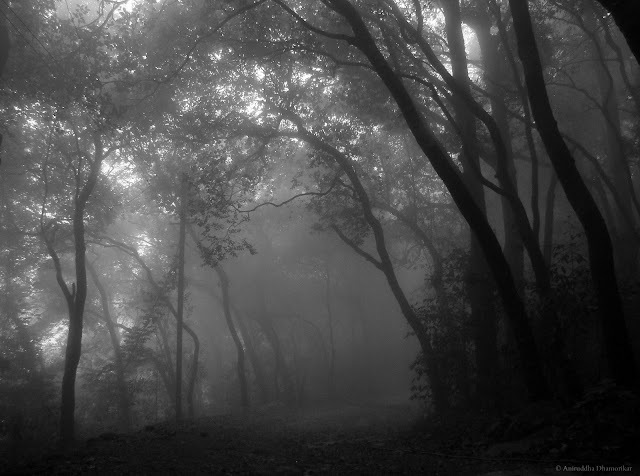 I don’t know if we woke up, for I found myself walking in the quietest of the woodlands – my soul escaped my body, my mind escaped all inhibitions, and I floated under the canopy, seeing-all, believing-all, wanting-more, never-satisfied. I wandered in silent woods, my friends in their own moods, and we sailed up and down to where the mountains took us, and I drifted off the path and entered into the forest. The ghostly flowers of Spurred Christisonia shone on the forest floor, orb-webs gleamed with droplets like tiny beads. I stood over the edge of the mountain, and staring out over the cliff where only white space was visible – with raindrops bursting on my face – I felt renewed. The charms of the crown forest worked their magic. Having come back to myself, I also have something to confess: I bought peace of mind from ‘neath the canopy of the trees Matheran helped grow for over thousands of years, and I bought it for free. It is said you must seek it under the shades of the tree whereof no man hath any knowledge. It was once anywhere and everywhere, now it is sold in very few places. cantik! < Beautiful >< Thank you for sharing your beautiful mind and picture. mind blowing. you see nature ani like no one i know. Totally loved it....and the last image..(forgive the metaphor)...kinda like icing on an utterly delicious cake :) Good job!